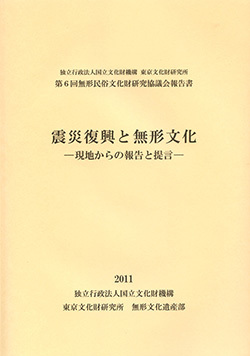 A report on the 6th Conference on the Study of Intangible Folk Cultural Properties was published in March 2011. 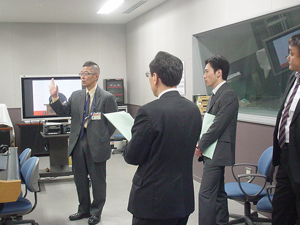 The conference was held on December 16, 2011 with the theme of “Intangible Culture Heritage in Post-earthquake Reconstruction.” Seven experts working on reconstruction from various standpoints were invited to give lectures and to discuss actual conditions and issues concerning intangible cultural heritage in post-earthquake Tohoku. Details of the lectures and discussion are included in this report in order to share information with and describe issues to as many people as possible. The report was distributed to relevant personnel, including all of the conference attendees. The entire report can also be downloaded in PDF format from the website of the Department of Intangible Cultural Heritage. In accordance with the Ministerial Ordinance to Revise Some of the Regulations Enforcing the Museum Act that was promulgated on April 30, 2009, Theories of Conservation of Museum Materials (2 credits) has been included in university or junior college courses to train curators. The course covers conservation of materials and exhibition conditions and will be required for accreditation as of this year. 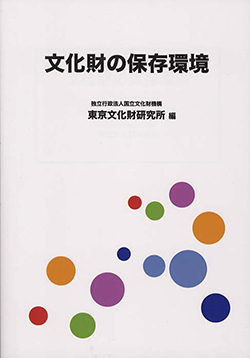 The National Research Institute for Cultural Properties, Tokyo has authored and edited what should be the standard text for the class and published it via Chuo Koron Bijutsu Shuppan. The book provides a basic knowledge of and skills for conservation of cultural properties in facilities handing cultural properties and outdoors. Much of the book deals with information related to the natural sciences, such as temperature and humidity and climate control. The book’s content has been carefully examined and selected so that even students in the humanities can readily understand it without a loss in quality. Another advantage of the book is that it is practical, so it can assist curators who are already involved in conservation. As mentioned earlier, the fact that the course is required has further emphasized the important duty that facilities handing cultural properties have to conserve those items. Drafting this text has been both an imperative and a joy for those of us at the Institute who have long been involved in studying conservation conditions. Hopes are that this text will teach students and shape their efforts. The year 2012 is the 100th anniversary of Japan’s gift of cherry blossom trees to the US. To commemorate the occasion, a variety of Japan-US exchange programs took place in conjunction with the yearly National Cherry Blossom Festival. Large exhibitions of Japanese art were put on by the National Gallery and the Freer & Sackler Galleries in Washington, D.C. under titles such as Colorful Realm (ITO Jakuchu: The Sakyamuni Triptych and The Colorful Realm of Living Beings), Hokusai: 36 views of Mt. Fuji (KATSUSHIKA Hokusai: 36 Views of Mt. Fuji), and Masters of Mercy (KANO Kazunobu: Zojoji Temple’s The Fiver Hundred Arhats). In conjunction with these exhibitions, the National Gallery’s Center for Advanced Study in the Visual Arts (CASVA) hosted an international symposium on The Artist in Edo on April 13th and 14th. 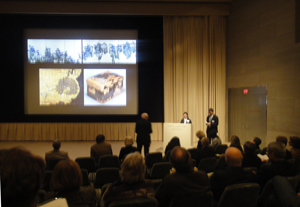 The symposium featured presentations by 13 Japanese art history researchers from Japan, the US, and Europe. Tomoko EMURA gave a presentation entitled “Classicism, Subject Matter, and Artistic Status—In the Work of Ogata Kōrin.” The symposium allowed presentations of research results to the global community, it facilitated exchanges with researchers from around the world, and it helped to further understanding of the Institute’s research efforts. The CASVA plans to publish a report based on the symposium’s presentations in 2014.